Canada Day – how will you celebrate? But what about everything else? Food? Beavertails and poutine if you want to get traditional (and stereotypical?). Or maybe some elk sausage with some Ontario spicy mustard? Maybe some local strawberry shortcake and a Quebec cheese plate to finish things off? Again, there is no limit, and it’s fun to explore the bounty our vast country has to offer. And the wine!! I mean, how fun would it be to pair your patriotic celebrations with some home grown vino? The Canadian wine spectrum has a lot to offer, and something to please any of your guests as you toast how mighty fine our beautiful country is looking at the age of 150. Here are a few suggestions to get your party started. Cheers! Malivoire Moira Rose – available from the winery for $24.95. You could also try their Ladybug available from the LCBO for $17.95. This is but a tiny selection – there are so many other wines from almost every single province in Canada from Nova Scotia to British Columbia. Whatever your preference, add to the festivities by including some Canadian wine with your celebrations. Happy Canada Day! Attending a wine tasting is not all fun and games. Sure, on the surface it seems like a blast, but there is a lot to think about. First, and most importantly, how can you possibly get through 70 wines in 4-6 hours? The answer? You can’t (well, I cannot). By hour 5, I’m seriously dehydrated and worried about my tooth enamel. Also of concern is how will you remember them? Can you really taste the difference between all of these? And, what about having to spit wine out in front of others (or spit wine at all)? Eek. This most recent tasting, on Superbowl Sunday, was hosted by Natalie MacLean. Our team of tasters include sommeliers, educators and other experts in the Ottawa wine community. It’s not only a great opportunity to taste many wines, but also a chance to learn from some pros and contribute our reviews to a massive online community which can help inform others. The goal of our last few tastings have been trying to identify great value wines that are available readily. My time that day was short so I arrived early knowing I would have to leave early, and therefore needed to make the most of the day. Given it’s currently the absolute dead of winter right now, I decided to focus on red wine on this particular day. Sure, white wine is great, but I am more interested currently in wine I could pair with roastbeef, or maybe short ribs, rather than caprese salad while sitting on a patio. A side note to this Louis M Martini, I tried it next to another Louis M Martini Cabernet Sauvignon, a 2011 which was from Napa. While the differences were subtle, I gave the slight edge personally to the Sonoma County wine for having a bit of an interesting caramel note, while the Napa was more typical (yet tasty – definitely not a negative attribute!) with notes of mint and green pepper along with the fruit flavours. From a value perspective, the Sonoma was also a great under $20 find! As a proud and patriotic Canadian gal, I’m always happy to try any wine from our great country. I also think that winemakers in Canada must possess some magic up their sleeves, judging by our last couple of winters. This is a delicious Baco Noir, rich, spicy, and would be great with nice cold weather dishes, or even just on its own. One of the benefits of being able to attend such an event is to try many different wines. On your own, you’re limited by budget, as well as the risk of potential liver damage, or the personal shame of letting wine go bad. In a group setting, you’re learning from others, as well as trying what some of their favourites are as well. It’s collaborative, social, and informative. Also, it’s great to arm yourself with additional knowledge when shopping for wine for your next occasion, be it Friday night, or your next Superbowl party. Last time (which was a while ago now!) 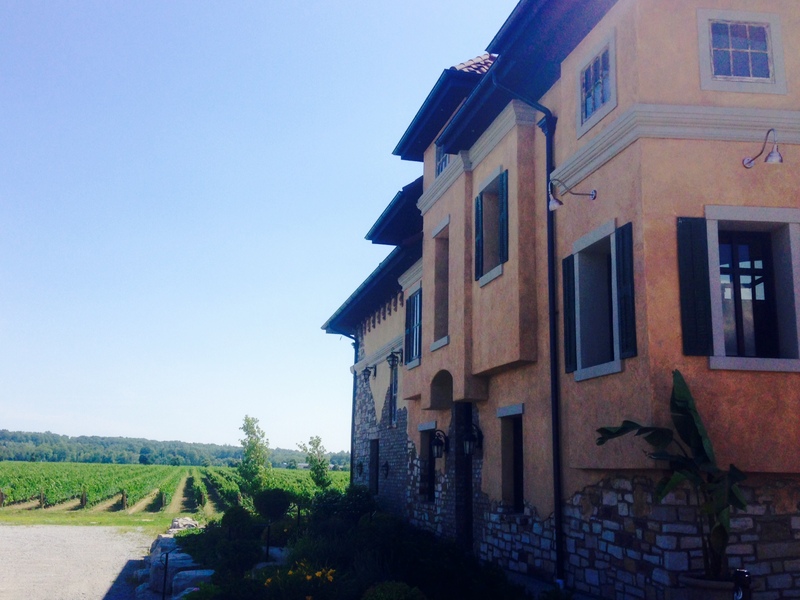 I only talked about some of the wineries we visited on our Niagara trip. There were too many for one post. I would also like to emphasize that I was working while there as well! After my meetings however, we did sneak off to a few more places. Colaneri was somewhere I had never heard of, but was also recommended by the people at Vineland. It is a newer vineyard, and have only been producing wine in the last 4-5 years. They are putting a lot of time and attention into their property and it was really gorgeous. The exterior looks like an oasis of an Italian Villa in a sea of grapevines. The people working there were lovely, very friendly. This winery is very much a family affair, with two brothers having married two sisters, and all of the different wines they produce reflects that family spirit. All of the labels are intricately illustrated, telling a story about a different family member. The stories were quite interesting (although some seemed a bit personal for putting on a wine label, but that might be just me). Also, the wine was unexpected and in a good way! All of their wines have some dried grapes included in the fermentation process, and some are made with 100% dried grapes. As a result, there are some interesting flavours. I really enjoyed their Cabernet Franc (it has 50% dried grapes), it was very tasty, full bodied, and had some rich flavours of dark red fruit, raisins, and even a hint of vanilla. So good! We also ended up taking home a bottle of their Pinot Grigio, which was light and refreshing and perfect for a hot summer day. It’s too bad we haven’t seen these wines in the LCBO, but I did see a Riesling of theirs on a menu at a restaurant lately, so it is nice to know they are around – and there’s always shopping online! The day we left the region to return home, I was on site at Niagara College during the day for a meeting. A professor there was part of our group and raved about their Teaching Brewery and Winery. Luckily I got to check out both (briefly) before hitting the road for our five hour drive. Both the brewery and winery produce wine and beer entirely by students. The brewery encourages experimentation and students can brew small batches using a variety of ingredients or styles. They also offer a more regular collection called the “Brewmasters” collection. You can try samples at the brewery and they sell bottles and refillable growlers. I bought a bottle of the Brewmaster IPA after tasting it, and I was a big fan, as I am of many IPA’s. Crisp, hoppy, and refreshing. Our final stop was the teaching winery. Here we noticed a variety of different labels. The best wine of the vintage (the wines are graded by a wine writer!) has the honour of earning the “Dean’s List” label, complete with tasting notes and their grade on the label. What an amazing honour for that talented student! We brought home a Dean’s List Cabernet Franc (apparently that was our preferred grape of the trip!) and it’s still here, just waiting to be opened up. Those students worked hard to make that wine, I think we’ll save it for a special occasion. Overall, we brought home a lot of souvenirs to commemorate a fun and very fast trip. Every time we open a new bottle, it’s a nice chance to reminisce, and think about the great memories we shared. As the supply starts to dwindle, I start thinking about where we should go next! I had looked at the Wine Country Ontario travel guide and highlighted a few places along the drive to our hotel to check out. Then we looked up the places we have already been to that we wanted to revisit. We’ve done tours before to see how wine is made, and although I love those, our main goal for this very short trip was to find and try great wine that we can’t buy at LCBO or that we’ve been curious about. One of our stops was at Vineland, as we noticed the wine options served at our wedding reception venue next year were all from this winery. We wanted to see firsthand what they had to offer. We had a great experience there from a very knowledgeable staff person (I really wish I remembered her name! ), and tasted a wide variety of their wines. Among the standouts that we bought were a Pinot Meunier – think of an even lighter Pinot Noir – which our wine expert friend highly recommended for someone new to enjoying reds, such as my fiancé. It is perfect for summertime, as often reds can be less refreshing. We also bought a Cabernet Franc from their Reserve series which we will save for a special occasion. Vineland has some great presence in LCBO and Ottawa restaurants so we left knowing we would be able to find these great options once back home. And we are looking forward to drinking some at our wedding next year! One wine we won’t find in many (if any, currently) Ottawa restaurants is from DiProfio. ‘The Kitchen Zinc’ is named for both the blend of various grapes used as well as the beautiful zinc bar you can belly up to in their tasting room. We had visited this family-owned winery last year on a tour and came back specifically to buy more of the Kitchen Zinc as well as their Gamay Rosé, which is pretty perfect with thanksgiving turkey if you ask me. Another highlight of this visit? The owner remembered me due to my red hair. I guess it pays to stand out sometimes! We really hope to see these wines on restaurant menus soon. The other spot we took a quick stop into was recommended from Vineland. Kacaba was somewhere I had not heard of but we were not disappointed. We ended up walking away with a Pinot Noir that was so good to share with a friend visiting for dinner last weekend. It was light and fruity with a bit of a spicy note. We also purchased a Cabernet Sauvignon that we will probably save for a steak night. To wrap up our first day (yes, this was all on our way into town!) we had dinner at Strewn. I had been looking online and read about their restaurant Terroir La Cachette. I would highly recommend the pizza here at the restaurant. They are simple, FULL of flavor, and located in a beautiful setting (although you can’t go wrong in this entire region, I’m sure). To accompany our pizzas we had some of the Strewn Two Vines Cabernet-Merlot which complemented our food well and is a great value for the price point. Also, it’s available at the LCBO! After a very full day, it was time to relax back at our hotel and get ready for another day full of meetings for me but hopefully a few more wines to try. We were happy to have packed so much into the first day of our visit but we’re looking forward to another great day! I just heard a cork pop and it’s too far away for me to get excited (I mean, it’s not in my hotel room) but that’s ok. It’s 5pm on a Tuesday. My girlfriends are napping because in our world (at least for the next day) there are no rules. We can go for dinner at 9pm. We can go gamble. We can go to a club that looks weirdly like a cottage from the outside and may or may not be filled with French guys attending bachelor parties. We are having a girls getaway in Mont-Tremblant, Quebec. We had a great laugh at the beginning of our trip about how a stereotypical guys weekend would compare to ours. We have a fridge FULL of food and drinks, and each have our own bed. We guessed that a bunch of guys would bring a case of beer and guess how many bodies they would cram into the room. All joking aside, we did completely overpack – for 3 relatively tiny girls we unpacked beer, wine (I counted 7 bottles, plus a mini), and some coolers, rye, Malibu rum, and amaretto just in case. Not to mention more eggs than I would eat in 6 months, veggies, fruit, yogurt, at least 2 cases of water (yes, cases), and enough chips and cracker type things to stock a small grocery store . Special shoutout to my friend Roxanne who made granola bars while I was lazy and bought some. She’s amazing! There’s really no downside, after all. It’s better to be prepared! We all love food and wine and we are driving so there is no fear of having to dump half a bottle down the sink because you can’t pack it for a flight. We can just load it up and bring it home for the next party, or for Thursday night – whatever works! And it’s great to have a home base in our hotel room where we can chat, eat, drink and be merry – and enjoy our time away. As mentioned, my travel companions are napping – so what am I doing? Just enjoying a glass of wine on the balcony listening to the sights and sounds of families returning to their rooms and casino diehards waiting for the shuttlebus. Wine: Bricklayer’s Predicament Cab-Merlot. 2012. Full bodied and fruity with a tart almost sour cherry on the palate and some young tannins. I am not eating with this wine but I feel it would do well to have a steak with it. One of the fun things about your friends is that you get to introduce each other to new things. It becomes like a game of ‘Six degrees of Kevin Bacon’ (or separation). For example: I went to Malivoire vineyard last year. Heard a lovely story about ‘Guilty Men’* wine. Brought a bottle of said wine to a girls’ night a few months ago (let’s just say it fit the theme of the evening). Fast forward to our trip, and my friend has brought it along because I introduced it to her! One of many funny stories we have shared this week. On top of the obvious reasons for a girls trip, like quality time, no work, lots of fun conversation, and sharing experiences, the best part of a trip like this is planning our next getaway. We keep talking about where to go next? And, in the meantime, perhaps I should find where that champagne was popped! * Guilty Men – I’m not sure I can’t do the story of this name justice but it’s pretty cool. Also, the wine is good too! The Malivoire winery is worth a visit! It’s been a fun but busy week, with travel to the Niagara region and back for a meeting and some fun. We visited 5 wineries and had some great meals! When putting away our treasures (11 bottles! and some mustard) from wine country, I realized that one bottle we had bought at Lailey (a 2009 Meritage) we had also bought last September when in Niagara-on-the-lake for vacation and still had it. I decided it was time to open the older one as now I had another one to save for a rainy day. After opening the bottle I’d been saving for almost a year, I noticed the cork was stained and a bit shrunken. I got a bit nervous and disappointed but still poured a glass. I had hope, faint hope it might be ok! My optimistic fiancé had a great suggestion which was to open the new bottle and compare them. Once the new bottle was opened, the issues were so obvious, but I can appreciate how a casual wine drinker might not understand exactly if there’s something wrong, or if they just don’t like what they are tasting. We also don’t always have another bottle to directly compare. See the photo below for differences in the cork. Now, here is where I admit my amateur mistake and offer a warning – store your wine properly!! This wine was recently laying down in a cabinet but for a while after we bought it, it had been standing upright – for long enough to dry out the cork apparently. This is fine if you’re going to drink the wine in the near future but not if you want to save it for any extended period of time. The cork protects the wine from oxidizing too quickly and if it dries out too much air will get in. 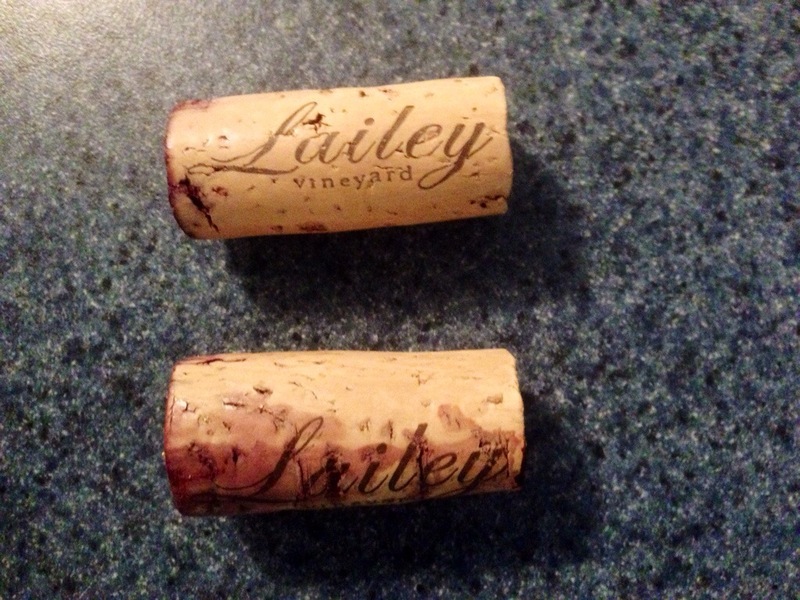 A side by side visual comparison of both wines in the glass didn’t show the issues obviously, but the “good”Lailey did have more fullness and legs on the glass than the “bad” Lailey. When tasting, “bad” Lailey almost had a fizzyness to it, and was acidic and thin. That wet wood taste was there as well. “Good” Lailey was just as good as I remembered: nice and full bodied, with a deep rich fruit aroma and tasted the same with a hint of cloves and the nice cedar note. I was so happy to have a good bottle! Many of us don’t have the proper conditions to store wine, our homes are too warm, and our basements are too damp (or in my case, non-existent). If this is the case, please don’t spend your life savings on the perfect bottle meant to be drunk when your child graduates from high school. Buy what you can properly store! If you really want to start cellaring wine, rent or share storage space, bribe your parents or friends with a big house to build a cellar or just wait until you’ve got the right conditions because you don’t want to be disappointed. I only have the room to lay down about 12 bottles so the few we have that we really want to save are getting the prime spots and the rest we will just have to drink. I guess we’ll need to have some company over to help! I personally find it fun to go shopping for wine (or beer, or whatever you’re feeling) at the good old LCBO. I love browsing the labels, reading the posted scores and reviews, sometimes buying something just for the airmiles, and picking out something I’ve never tried before. Or, buying a stand by that I’ve always enjoyed and know someone else will love. 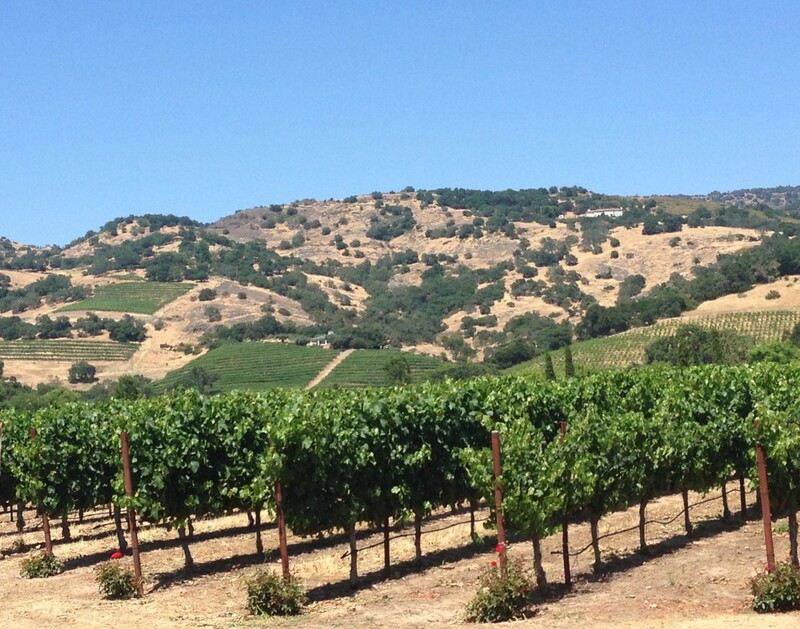 Recently, having just come back from California, it was exciting to come across a few special bottles in the Vintages section from a winery we had just visited in Napa Valley, Clos du Val. So exciting, in fact, that we splurged and bought both the Cabernet Sauvignon and the Zinfandel for a cottage weekend, although I would hardly classify either of these as a typical “cottage wine”. Besides both being fabulous wines (I have reviewed each briefly on the nataliemaclean.com website if you’re interested), they brought me right back to our wonderful vacation, and had my fiance and I reminiscing before we’d forgotten any of the details of our trip. One of the things I find interesting about wine is that it seems to evoke a lot of emotions and feelings in people. I know personally, since I’ve been back from California, I’m sticking to that section of the liquor store. Fortunately for my Canadian tastes, I am heading to the Niagara region next week for work, so I’m sure I’ll see my shopping shift in that direction, especially after stopping into a few wineries between meetings :). For me, my ever shifting taste in wine is what keeps it so intriguing! If I’m at a party and get to try a new Malbec from Argentina, chances are that I’ll pick it up the next time I’m shopping for another party or event. I think that aspect of sharing the knowledge is another reason why I wanted to start writing about wine!